Want to build a deck using this card? 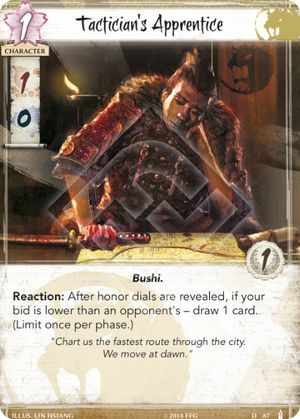 Check out the Legend of the Five Rings Deck Builder! So was thinking would this ability trigger on a Maze of Illusion as the player using the Maze is revealing their honor dial? If I use a Contingency Plan, can I then trigger this? So I could get 1 honour off my opponent and still very a card? Relying on a lower dial, I've found, works first turn as a surprise and no other. I'll possibly try this but I don't expect anything from it really. (Limit once per phase.) Does this mean that the ability could be triggerd again if honor dials are used in the conflict phase? I welcome 1 drop Bushi characters for the new SH. If you look at the text as a plus rather than relying on it, Happy days. No surprise here, as its a visible ability on the table. I agree not to expect much from this card. If Lion can get Honor Dial manipulation, I think they could benefit more overall. I've been sour on this guy because if you're bidding 1, you will tend to only be lower than your opponent on turn 1. And having this guy out telegraphs that you're going to bid 1, right? But then I realized I've been thinking about it all wrong. This guy's prime value isn't in bidding 1, it's bidding 4 (or 3 if they've caught on), allowing you to bleed off a little honor from a 5 bidder while still drawing as much as them. And if your opponent bids 1 to shut him off, as Lion you can weather the honor loss pretty well. It's not the greatest ability in the world, but better than I thought it was and comes with a super cheap body. Yeah, I'm not that convinced for myself. Composure will make him interesting? For sure, against Scorpion you can bid 3 and profit whether they bid 5 or 1. Scorpion ceases to function when they're not drawing fast, as Lion is better on the table, Scorpion is better in the deck.